No matter where you live or how careful you are, there’s always a chance that someone will want to mess with your stuff. It’s a pity that we have to spend so much of our hard-earned cash on security, but at least those security systems are incredibly advanced these days. One of the best tools to help you keep an eye on things is an IP/WiFi camera.In 2017 we’re starting to see a real revolution in the technology. So join me in looking at the five cameras that have impressed the most so far in 2017. The Logi Circle camera represents the evolution of IP cameras from a specialist security technology product to something that should be as consumer friendly as a microwave or toaster. Just looking at it you can tell that this is not something designed to be purely functional, it’s simplifies and elegant to the point where you may feel you’re being condescended to. One of the coolest features of the Circle is it’s internal battery and baseplate design. The camera itself is a detachable, self-contained ball that you can move around as you please. It will run up to 12 hours from the internal battery until you pop it back in the magnetic base. You get two-way communication through the camera thanks to the speaker and the software is straightforward, if a little basic. The best part of the Logi Circle has to be it’s looks. While other tech trends are tending towards a retro & vintage design, Logi is unabashedly futuristic, which is a major reason this camera stands out. 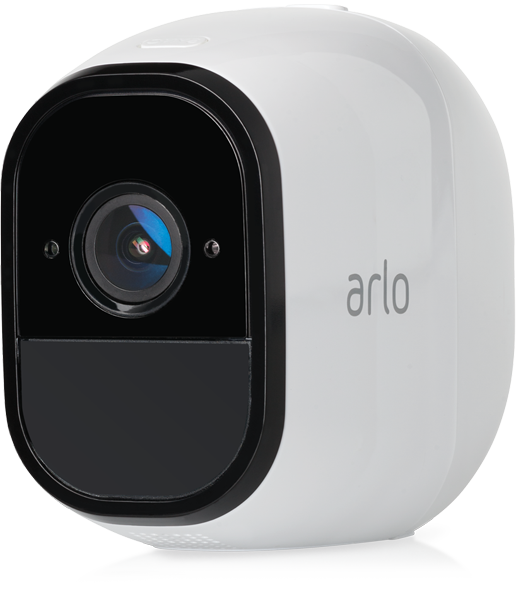 While the Logi Circle may be a decent step forward in the quest to make smart security technology more home- and user- friendly, the Netgear Arlo Pro feels like a leap into the future. To be sure, you pay for the privilege of this high-tech camera, but it’s also clear where the money is going. This is a true wireless outdoor camera. No power, no network cable. The onboard battery will, according to Netgear, keep the Arlo Pro going for up to size months without a recharge. You do still have the option of keeping it connected to the mains, but now it’s a choice rather than a need. On top of this it’s IP65 certified, so come rain, sleet or snow the camera will be none the worse for wear. Apart from some very clever motion detection, two-way communication and the ability to directly backup to a USB drive, this camera has one feature I have been waiting for: a siren. There’s a 100+ decibel siren that will alert both you and the crooks that they’ve been caught. Yes, this is one of the most complete security camera solutions that I have yet seen. The siren is built into the base station and you can add more cameras without needing more of these stations, centralizing the system to one point. If you have the money to spend on a few of these cameras you’re set with one of the best and most advanced IP camera offerings I’ve seen. Believe it or not, what you’re looking at here is actually a camera. Not an ashtray or some weird lidded-bowl. This product from LG comes with ADT Canopy compatibility, where you can subscribe to ADT’s cloud service and have a running record of the last seven days’ worth of footage. If you don’t want the ADT subscription you may find this camera less compelling, since some of its features depend on that service. This is more than a camera, giving you the ability to measure heat and humidity and to control smart home automation devices that use Z-Wave, a home automation standard. All in all, this is a great prosumer security solution. Nest is one of the foremost names in home automation, busting into the market with their highly-successful Nest Smart Thermostat. They’ve now started to turn their attention to other IP devices in the home and this Outdoor version of their in-home security camera is certainly an attention-grabber. Yi technologies are associated with Xiaomi, a company that’s been referred to as the “Apple of China”. Certainly Xiaomi have been making big waves with their well-specified phones, tablets and other electronics which are sold at incredibly competitive prices. Under the Yi brand there have been more than a few excellent products. Notably the Yi action cameras that give GoPro products a run for their money at half the price. While Yi products tend to have some compromises (nothing is free after all) the good usually far outweighs the bad. When it comes to the Yi Home Camera 2 that trend continues. This is a very affordable camera that comes with features you’d expect to pay more for. The price of this IP camera is about what you would pay for one of those rather nasty basic D-Link cameras that were hacked not too long ago. For the low asking price you get a 1080p recording at 25fps with a wide angle lens, infrared night vision and an SD slot for local video storage. The software is great as I’ve come to expect from Xiaomi and all the features you really want are present. It’s hard to believe that the company makes any profit selling such a great product at this price. The future of the world is one where everyone is watching all the time. The good news is that it won’t just be Big Brother watching all of us, we’ll each be a “little brother” gathering intelligence of our own. It may be a small consolation, but it makes me feel better. These hi-tech 2017 cameras are amazing, but for most people they may be a little overkill. Luckily there are plenty of more mainstream cameras to choose from. Check out these reviews of what I think are the best cameras the average person can buy today. Written by Kostas Chiotis, who may or may not be watching you right now! All Images are the properties of their respective copyright holders. These promotional images have been reused here under a Fair Use rationale.